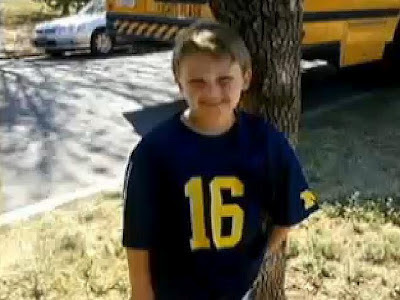 In the odd chance that you didn't already know about Cooper Barton, the 5-year old boy from Oklahoma who was forced by his elementary school to wear his Michigan t-shirt inside out, then this headline would probably seem pretty strange. Well, when the sun shines, make hay. In speaking at the Detroit Economic Club's football kickoff luncheon event today at Michigan Stadium, Dave Brandon took the opportunity to announce that the boy along with his family will be invited to a Michigan football game this fall. And, the M-Den will have a special shirt for Cooper, which will have a block-M on the inside of the shirt. Got to admit, good of Brandon and the M-Den to be out in front of this. DB also dropped a few other bits of goodness during the talk. AnnArbor.com's Nick Baumgardner tweeted from the event. • UM athletics will be a $133 million dollar business this year. • Concerning playoffs, extra games are a "slippery slope" and it's "troubling". • Networks are fighting over who gets to air the 2014 Appy State game. Brandon likes this. • Its been a tough couple years for the B1G re: sanctions. • Brandon still wants to play UConn next year, but is talking with other venues so as to not play at UConn but the Huskies are bound by legislation to play on their campus. The Meadowlands in New Jersey was mentioned as a suitable venue. • He "got the hell beat out of him" after announcing the 2011 night game. • Night game #2 needs to be special with a special opponent. • There will be a night game in 2013. No ifs ands or buts. • Original plan was to take a bus, and play venues along the way. Band changed their mind and decided they will just fly. • The plane more than doubled the expense, donors will pay half and UM will pay half. • Brandon: "The band is coming to Dallas, and I hope you enjoy every minute of it." • The old way of retiring numbers at Michigan was "lousy". • Forced him to rethink and come up with the legacy jersey idea. • The away jersey for Bama is a one-off, will not be repeated. UM will keep the standard jerseys for the regular season, could see a special jersey for the bowl.